Pat hard at work...making carpets like new! Do you love what you do for a living? Pat Bitterman does and it shows. Everyday he’s grateful to do a job he loves and he truly enjoys the interactions he has with his customers. His enthusiasm for the trade and professional training makes him the premiere cleaner in Mid Michigan. Pat, has a vast knowledge of carpet construction and proper procedure for both repairing and cleaning your carpet. In the past you may have experienced carpet cleanings that didn't live up to your expectations, or not even close. This is not what you will get with Twin Lakes Carpet & Floor Care's service.We don't subscribe to the old "Splash and Dash" way of cleaning. In other words we take our time and make sure we are giving you the best cleaning possible. Pat retired from a local school system after 30 years of maintenance and custodial work. While working, on the side, Pat cleaned carpets. Pat is very well known for his meticulous nature and hard work ethic. We call it OCD (OBSESSIVE CLEANING DRIVE). 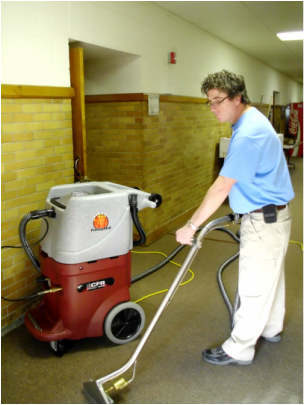 After Pat retired from the schools, the private demand got so great for Pat to clean carpets and hard floors, that Pat decided to invest in the best equipment and do what he knows (and does best), floor care! Pat (who has been cleaning carpets in the area for over three decades) along with his assistant will be personally cleaning your home or business. We take satisfaction in the fact that we do things differently than most other area carpet cleaning companies. Our goal is to make lifetime customers not one time patrons. please feel free to call Pat on his cell (989) 339-7180 or the office (989) 544-2141.